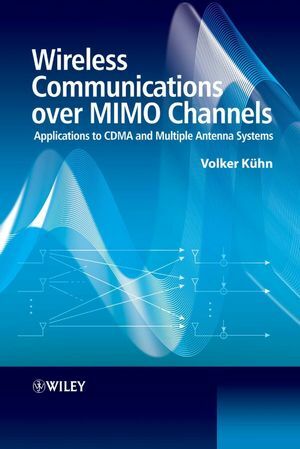 Wireless Communications over MIMO Channels: Applications to CDMA and Multiple Antenna Systems covers both, state-of-the-art channel coding concepts and CDMA and multiple antenna systems, rarely found in other books on the subject. Accompanying appendices include: basic derivations, tables of frequently used channel models, chain rules for entropy and information, data processing theorem, basics of linear algebra, Householder reflection and Givens rotation, and the LLL algorithm for lattice reduction. Volker Kühn is Assistant Professor, at the Department of Communications Engineering, University of Bremen, Germany. He completed his Ph.D. at the University of Paderborn, Germany (1994-1998). He has also undertaken consultation work for Siemens AG and Infineon Technologies, and is a member of the IEEE.